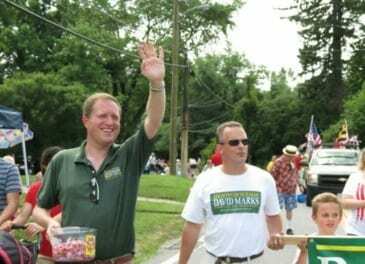 Baltimore County Councilman David Marks announced on Tuesday that he would seek re-election, pledging to continue his “record of bipartisan and independent leadership for the citizens of the Fifth District,” according to the official press release. “While other governments are embroiled in partisanship and stalemate, we have worked across party lines to deliver unprecedented results for the Fifth District—three new schools, eight new parks, and neighborhood improvements from Charles Street to the Harford County line,” Councilman Marks said. § A complete renovation of Dumbarton Middle School, the air conditioning of every public school in the Fifth District, and construction of Perry Hall’s first new school in a quarter-century. § Eight new parks in the Fifth District, including the first along the Loch Raven Boulevard corridor in a half-century; Towson’s first new park in a quarter-century, Radebaugh Neighborhood Park; and Angel Park, a community-built playground and amphitheater built to accommodate all children, including the disabled. § The downzoning of thousands of acres of land to lighten school overcrowding and preserve green space, including the most land ever downzoned in Towson, Carney, and the Cromwell Valley. § Passage of the social host ordinance, a nationally-recognized law that is reducing unruly disturbances in neighborhoods near Towson University. § Construction of new fire stations in Towson and Kingsville. § The revitalization of Downtown Towson and areas along the East Joppa Road corridor, including the Raytheon site, which had been derelict for more than a decade. Councilman Marks has sponsored major pieces of legislation that passed with strong bipartisan support. His bills created the Baltimore County Charter Review Commission; expanded public input during the development process; required architectural metrics for new construction in Downtown Towson; established the Baltimore County Pedestrian and Bicycle Advisory Committee; designated the Perry Hall commercial revitalization district; and put in place Neighborhood Commons, a zoning designation that protects open space. § In Towson, a circulator to improve mobility; construction of a new Towson High School; stabilization of the Herring Run watershed; and resurfacing of major routes such as Bosley Avenue and Stevenson Lane that was put on hold by the Kamenetz administration. § In Loch Raven and Carney, the resurfacing of the Joppa Road corridor. § In northeastern Baltimore County, construction of a new middle school and high school; renovation of the Perry Hall Mansion, and completion of a new regional recreation center at Mount Vista Park. First elected in 2010, Councilman Marks was previously the ten-term President of the Perry Hall Improvement Association and an Officer in the Baltimore County Historical Trust. He has worked as a transportation professional and an instructor at Loyola University Maryland. Baltimore County’s Fifth District includes Towson, part of Loch Raven Village, Carney, Oak Crest Village, Perry Hall, White Marsh, and Kingsville.